To bend 7 TeV protons around the ring, the LHC dipoles must be able to produce fields of 8.36 Tesla. Superconductivity makes this possible. The LHC machine will contain around 2000 main ring superconducting magnets cooled at 1.9 K by super-fluid pressurized helium. 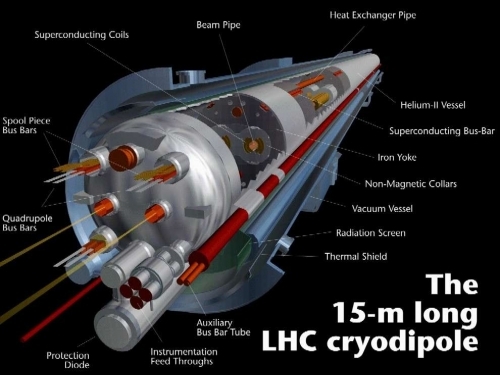 Figure 1 shows the concept of one of the 15 m-long LHC cryodipole. The magnet dipole, enclosed in the Helium Vessel with heat exchanger and cold bore tubes, forms the dipole cold-mass. The work temperature of the cold-mass is 1.9K. The cryostat of the dipole magnet consists of the three supports to position the cold mass, a radiation screen, a thermal shield both equipped with multi-layer super-insulation, and a vacuum vessel. The dipole cold-mass assembled into the cryostat forms the Cryodipole Magnet. To ensure the correct functioning of the LHC, it is necessary to know the exact position of the cold mass in the vacuum vessel. This allows the correct positioning of the particle beam relative to the surveying points placed on the external face of the vacuum tube. During cooling and an increase of the magnetic field, the cold-mass changes its size, shape and position. The expected longitudinal deformation of the 15 m long cold-mass will be around 20 mm, caused mainly by thermal contraction. Determining the horizontal displacement of its extremities is much more important, but more difficult. This was the main goal of this project and in order to realize the measurements a new displacement sensor was developed. The extreme environmental conditions and the geometry have imposed several constraints during the design of the displacement sensors. Since the longitudinal displacement was significant (20 mm), it was not possible to install an optical fiber between the vacuum vessel and the cold mass. 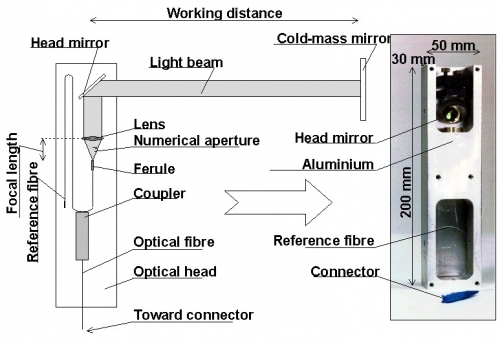 Therefore, it was decided to use a light beam propagating in the space between an optical head installed on the inner wall of the vacuum vessel and a mirror attached to the external surface of the cold mass. Optical fibers are used as a reference path in the optical head and to bring the light in and out of the vacuum tube. Functional principles and components of the displacement sensor are presented in Figure 2. The first two measurement heads were installed in a test dipole in April 2000. The installation proceeded without problems and the optical alignment required less than 30 minutes. 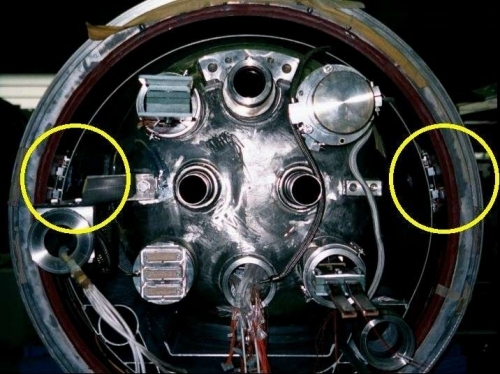 The sensors were installed at the dipole end as shown in Figure 3. A few days later the dipole was provided with end-caps and was displaced from the assembly hall to the testing hall. Measurements were registered during transportation and later, during the cool-down test. 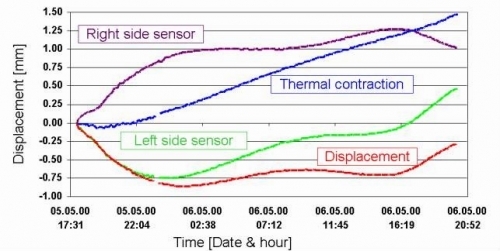 Figure 4 shows the recorded displacements during the cool-down test. It can be noted that the measured contraction of the dipole corresponded well to numerical simulation, while the displacement was much bigger than expected. The measurements are now regularly performed on each new LHC dipole with the addition of a third sensor installed below the dipole to measure vertical displacement.